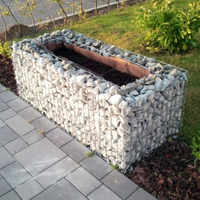 Reinfoced Gabions - Buy Reinfoced Gabions Product on Hebei Gabion Hardware Wire Mesh Co., Ltd.
Reinforced gabion box has two kinds, one is the reinforced gabion mesh production, another is behind the stone cage net with a mesh or dragging a mesh. 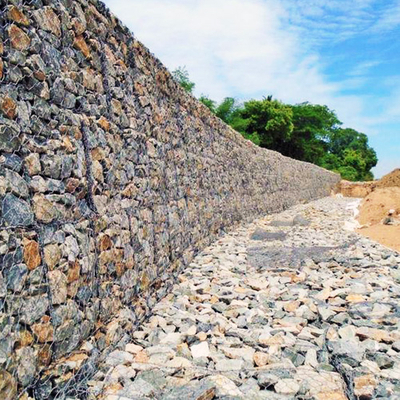 1 reinforced gabion mesh refers to the braided wire, woven in perpendicular or parallel to the long, with six mesh wire mesh with the same material. 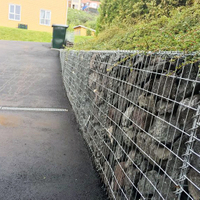 The tensile strength of reinforced angle of six mesh was higher than that of ordinary six hexagonal mesh, reinforcement wire diameter generally less than the edge of wire diameter. 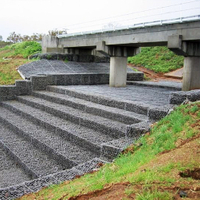 Installed on the subgrade, especially when tensile stress is high, it can absorb the gap value of tensile stress and fundamentally weakened cracks or traffic generated. 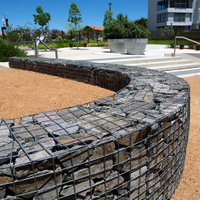 2 reinforced gabion boxes is cage even after heavy six hexagonal mesh cage, as the reinforced connection net sheet into the soil, the soil and the mesh friction to provide certain anti slide force, has a good environmental compatibility.